We will play doubles, starting with warming up and then checking the scores in small friendly tournaments. We will shuffle from time to time so it will be more interesting and fair. * Price may vary slightly depending on the number of participants, 22,5 €/1,5 h per court (last time each paid 6€). * Please note, that I will not be able to answer the phone once we begin, so please make the calls before the start time. * I will bring shuttlecocks. If you don’t have a racket, you can rent one from the sports center for 4€. 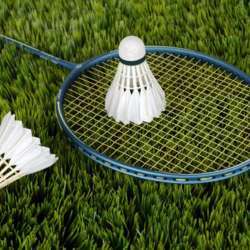 Looking forward to seeing fellow badminton players at the court!